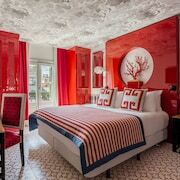 A stay at Renaissance Barcelona Hotel places you in the heart of Barcelona, walking distance from Casa Batllo and Casa Amatller. This 5-star hotel is close to Palau de la Musica Catalana and Sagrada Familia. 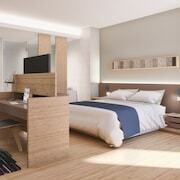 Make yourself at home in one of the 211 air-conditioned rooms featuring iPod docking stations and minibars. Your room comes with a pillowtop bed. Flat-screen televisions with satellite programming provide entertainment, while wireless Internet access (surcharge) keeps you connected. Private bathrooms with shower/tub combinations feature complimentary toiletries and bidets. Enjoy recreation amenities such as a 24-hour fitness center or take in the view from a rooftop terrace. Additional amenities at this hotel include wireless Internet access (surcharge), concierge services, and shopping on site.